In this Monday’s Charlotte City Council meeting, the council unanimously passed a motion to purchase 5516 Central Avenue - a 3.89-acre parcel with a 36,865 square-foot building to consolidate 130 Innovation and Technology (I&T) Staff currently located in three separate facilities. Councilwoman Dimple Ajmera worked closely with the staff to prepare and vet the investment proposal. Ajmera is a CPA with a keen understanding of the financials presented. "This investment in rehabilitating a vacant office building will result in multi-million dollars in GDP impact," says Dimple. "It will also help businesses along the corridor and further reinforce our commitment to economic development in East Charlotte." Charlotte has tremendous growth potential in the innovation and Technology sector. There are more than 44,000 I&T professionals currently working in the Charlotte area. Experts say the region is expected to add more than 8,000 IT jobs by 2025. Council Woman Dimple Ajmera is currently running for an At Large position on the Charlotte City Council. She is one of four Democrats out of a field of seven to move to the City Council At Large race. Early voting has started at Hal Marshal Annex with additional locations opening next week. Election day is November 7. Click for early voting dates and locations. 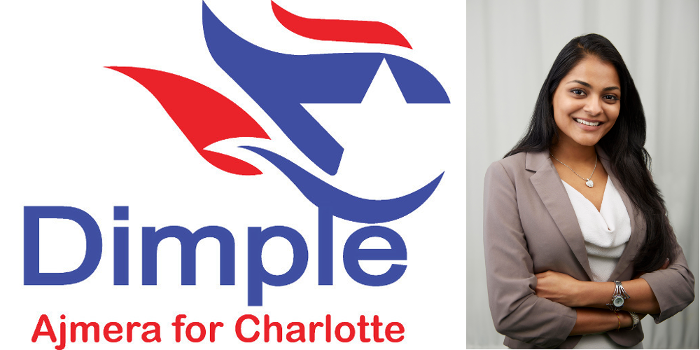 Dimple is the is the first Asian-American and the youngest woman to serve on the Charlotte City Council. Her track record on City Council and business acumen as a CPA has earned her the endorsement of former Bank of America CEO Hugh McColl, the Honorable Harvey Gantt, Black Political Caucus (BPC), Firefighters, AFL-CIO union members, Human Rights Campaign (HRC), MeckPAC and Equality NC, just to name a few supporters. Please get out and vote for Dimple and keep our City Council working for infrastructure and job creation. EVERY VOTE COUNTS!